It was the Dasara holiday weekend and with all the tourists thronging the park, Bandipur adorned a festive look, more like a city rather than a National Park. The Bandipur National Park reception was overcrowded and there were lots of people any direction you looked. In all the commotion, an interesting scene caught my attention. 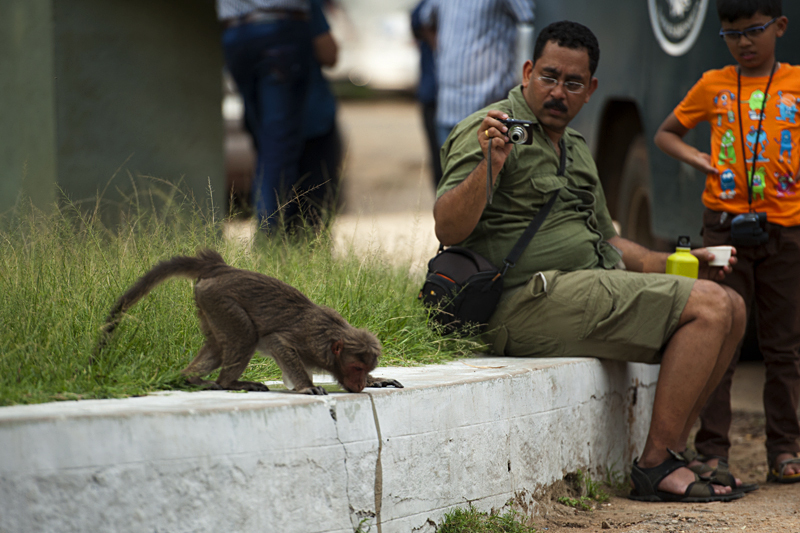 A Bonnet Macaque was licking the tea left behind in a cup by some careless tourist. And another tourist was photographing it, coincidentally holding a cup of tea in his other hand. As we entered the Bandipur National Park, a pair of White-bellied Woodpeckers flew by and perched on a dead tree trunk. As we moved deeper, I noticed that the forest was lush green from the monsoon showers and there were many large herds of Chital, Spotted Deer, indicators of a healthy forest. When we reached a waterhole, we noticed a large herd of Chital fleeing with their tails up. 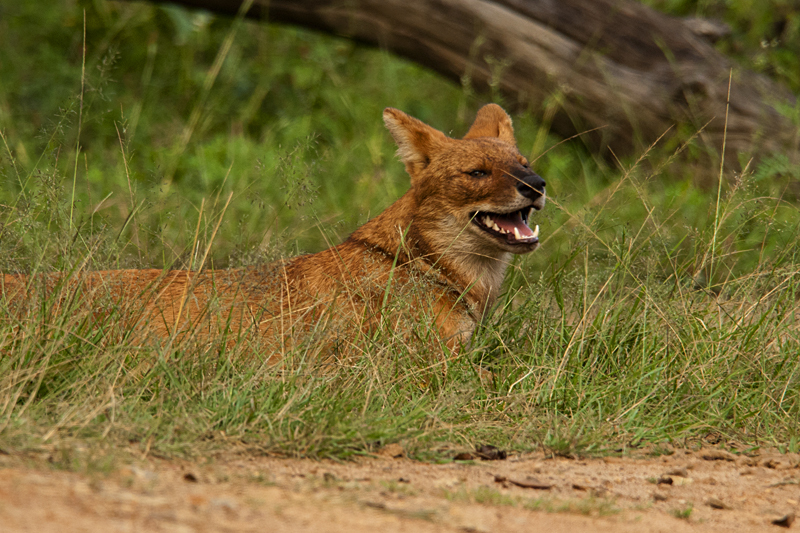 I immediately realised that this behavior meant that Wild Dogs (Dhole) were in the area and I looked around. We didn’t have to wait long before a Wild Dog came strolling along the safari road. He looked in the direction of the fleeing Chital and settled down right in the middle of the road. 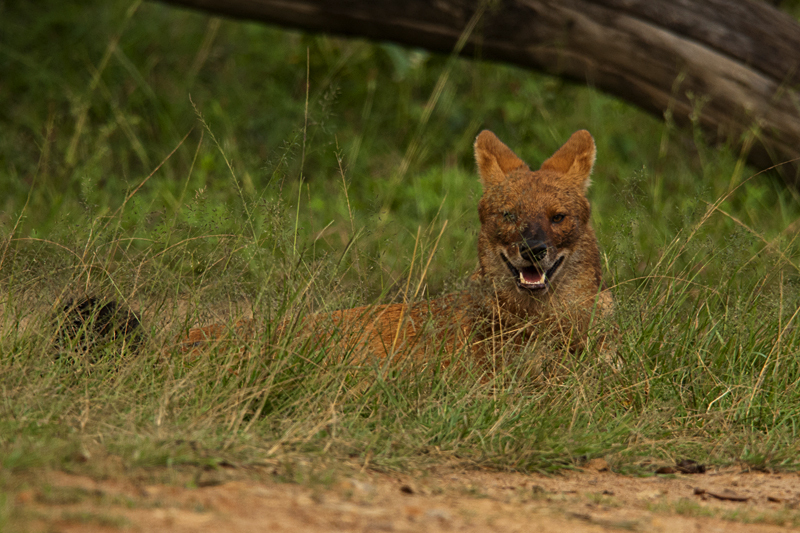 Once he settled down, we moved a little closer and that is when we realized that this was a single Wild Dog (Dhole), which might have got separated from its original pack and was probably looking to establish itself in another pack. The lone Dog looked restless all the time and it was frantically looking around trying to catch the scent of other predators or other packs that might have visited this area. The news of the sighting of the endangered Wild Dog spread fast amongst the safari vehicles and a couple of forest department safari vehicles came rushing to the scene. The noise of the approaching vehicles spooked the Wild Dog and it got up and moved in our direction walking right past our parked vehicle. He stopped once again at the another turn on the safari road and scent marked the area, before disappearing into the Bandipur Wilderness. The restless behavior if this lone Wild Dog was a clear giveaway that it was actively searching for a pack of Wild Dogs to establish itself. 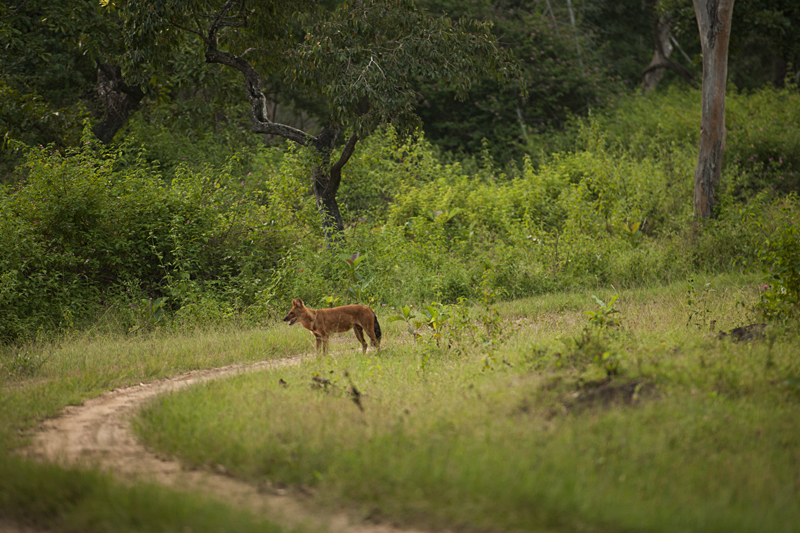 We have had many wonderful sightings of Wild Dogs commonly known as Dhole in the South Indian forests. 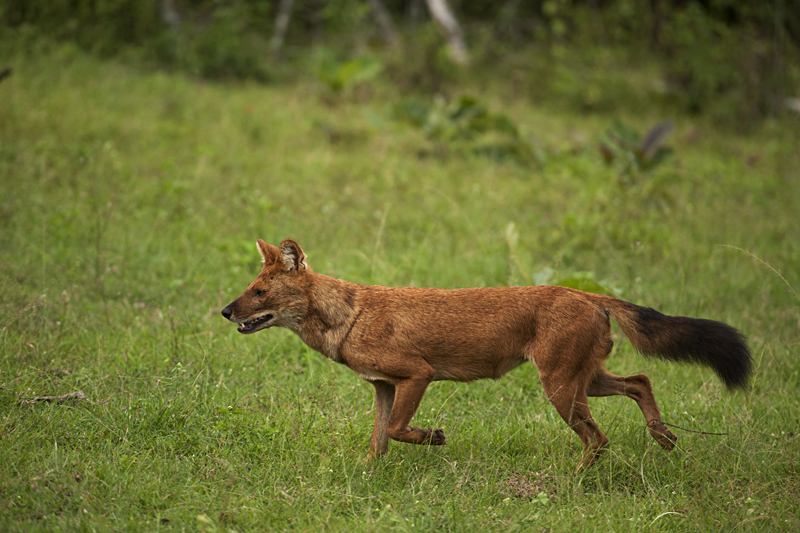 The best sighting of Wild Dogs was indeed the first post on Walk the wilderness which you can read here. Great sight. So far I have never seen wild dogs.